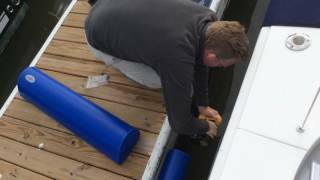 Determine where on the dock face you want your fender attached; ensure sufficient substructure available for securely fastening at least six screws through track and into dock’s structure. Pre-set six stainless steel screws into mounting track’s pre-drilled holes. Align top of mounting track slightly below top edge of dock face or at the elevation desired. Drive top center screw through mounting track and into dock face / substructure. Level the mounting track and drive a second stainless screw. Check with level and then drive the remaining stainless screws, ensuring screw heads are flush with mounting track’s face. Holding the fender with bolt-ropes inboard, guide the bottom bolt-rope into the mounting track approximately 1inch. Then guide the top bolt-rope into the mounting track and slide fender into place.